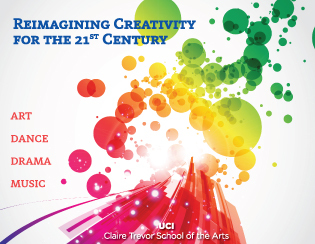 Click here for the Claire Trevor School of the Arts brochure. B.Mus. in Music Performance with specialization in Guitar/Lute, Jazz Studies, Piano, Voice and Winds, Percussion and Strings. The Claire Trevor School of the Arts has four departments: Art, Dance, Drama, and Music. Please browse each department page for more information. Please see the UCI General Catalogue for details about specific major & degree requirements, courses and faculty information. The Claire Trevor School of the Arts offers a minor program in Digital Arts, Digital Filmmaking, and Drama. Students complete a UC application and submit it by the deadline for admission. All majors in the Claire Trevor School of the Arts accept admissions for Fall Quarter only. The application filing period for Fall Quarter is from November 1 to November 30 of the previous year. For more specific admission requirements to UCI, please check the homepage of the Office of Admissions and Relations with Schools. You may apply to the University on-line via http://www.ucop.edu/pathways/appctr.html. Visit the UCI Financial Aid website for more information on the financial aid application procedures. Auditions, generally held in late January and in early February, are required for admission to Dance and Music. Audition information for the Dance Department is available here. Audition information for the Music Department is available here. Please note: Art does not require a portfolio for admission into the undergraduate program. Drama does not require an audition for admission into the undergraduate program.